As Ethiopia’s Prime Minister Abiy Ahmed travels to France for an official visit initiated by French President Emannuel Macron, Ethiopian Defense force reportedly clashed with Oromo Liberation Front (OLF) militia this morning in Gedami locality, Qelem district of Wolega, Western Ethiopia. “There has been an intense exchange of fire in the areas between Begi and Qelem districts since yesterday morning. From what I heard, the clash is between Ethiopian Defense force and OLF troops,” BBC Amharic service cited anonymous sources in a report it published today. Another anonymous source who is living in Gidami area told BBC Amharic that there has been an exchange of fire since Sunday morning. Also, the report added that 6 Urals of government soldiers have entered the town this morning. Qelem district head, Tamene Hailu, on the other hand says that there was no clash between Ethiopian Defense Force and OLF troops. “There were demonstrations recently which demanded that OLD should not disarm and they were carried out peacefully. Other than that, there was no clash-what so ever. It is a facebook rumor,” BBC Amharic quoted him as saying. However, Tamene admitted that there have been road closures this morning in some towns in the zone following demonstration called to oppose government position that OLF has to disarm and elders working to resolve the issue. On the other hand, BBC Amharic cited Medical Director of Dembi Dollo hospital, Kibret Waqgari, who confirmed that three policemen were in hospital for wounds from grenade attack. Ethiopian government media outlets have not reported about it at this writing. US based Ethiopian Satellite Television (ESAT), reported that government troops are taking measures against armed OLF troops in Western Wollega zone and Guji zone, where OLF fighters killed three government soldiers about two weeks ago. 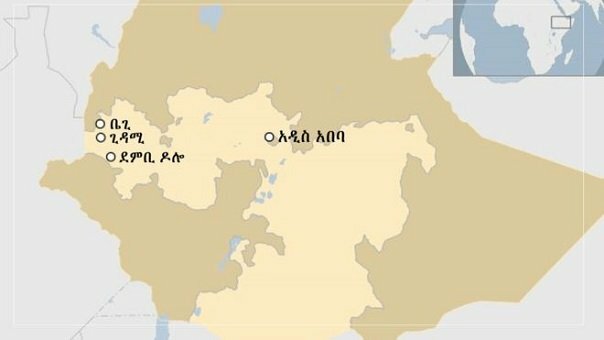 ESAT report added that several OLF fighters are wounded and killed since Friday as government resorted to disarm OLF, seemingly ensuring the rule of law in the country. As well, ESAT cited eyewitnesses from the area where there is a reported clash between government troops and OLF fighters and they say that there is still tension in the region. Oromo region’s security sector head, Colonel Abebe Geresu, told ESAT that government is disarming OLF rebels in the region but he dismissed the news of war in the region. In an interview with Walta information, OLF leader Dawud Ibsa said that his organization has not agreed to disarm and that his rebel fighters will not disarm. Government reaction was a stern warning for OLF either to disarm on its own or else government will do it.